With the onset of the wedding season, one strong trend that emerges every year is that of ‘Floral Jewellery’. And this year too, one will see numerous types of flowers being interpreted in creative ways and then bejewelled with sparkling diamonds and gemstones. While roses, lilies, carnations and lotuses are some of the most common flowers chosen for jewellery, there are a few designers who have picked a few uncommon flowers like Cherry Blossom, Daisy, Ninfea and more and the results are gorgeous blossoms sparkling under every hint of light. Every bride has that one favourite flowers that must be present in the wedding décor, for example, or in the bouquets of the wedding entourage. For some brides, however, a bouquet or a flower centre piece at the reception alone won’t cut it. They make it a point to match their dress and jewellery with hints of their favourite flower. It’s a good thing then that the jewellery industry is keeping up with this particular wedding trend. 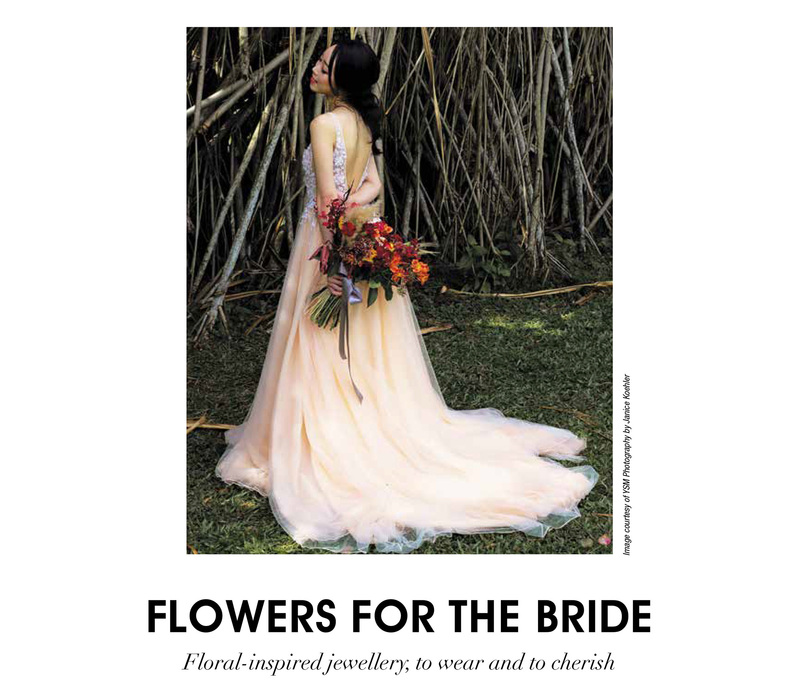 Moving beyond roses and lilies, fine jewellers now offer a wide range of flower-inspired pieces, each bringing a special fragrance with them for the ever-diverse choices of the modern bride. Another wild flower that is most beloved by many brides is the daisy. From the bridal bouquet to the decorations, daisies add a touch of romance and innocence to the whole affair. Turning this childlikeness into modern jewellery is Tiffany & Co. with its all-diamond daisy brooches that represent the famous white daisies. For those who wish to bring in a little colour, they can opt for the version with coloured gemstones. 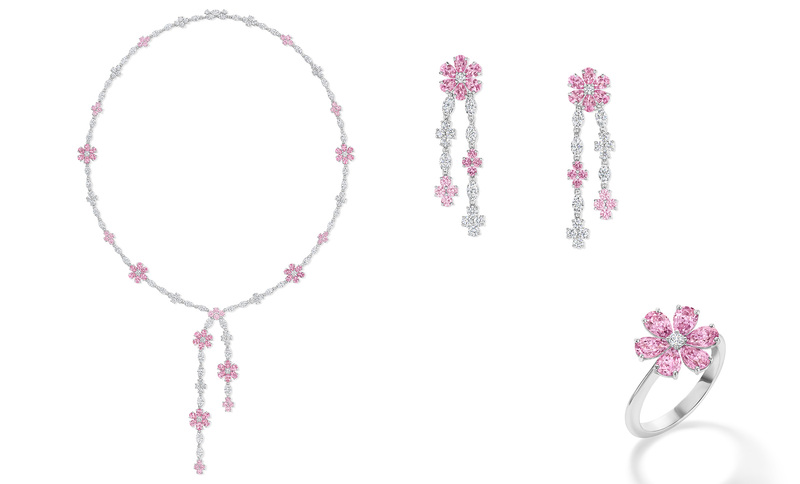 Taking inspiration from the organic, fresh, and vibrant Ninfea flower, Bangkok-based jeweller Sartoro has transformed the idea of a flower’s fragrance into a dazzling pink sapphire and diamond jewellery collection. 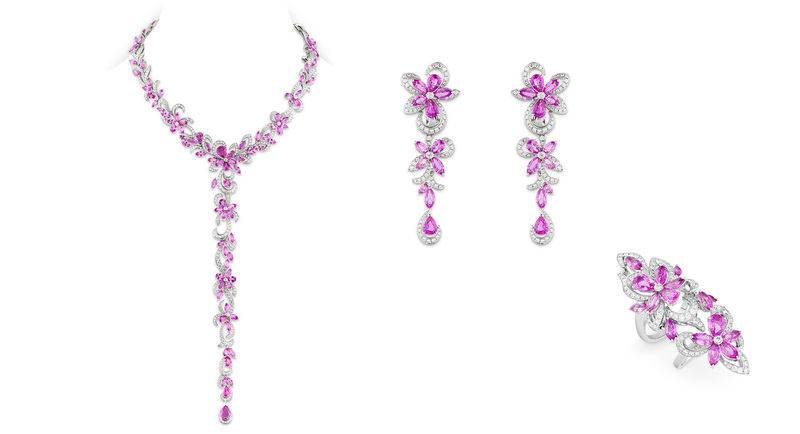 The use of different shapes of pink sapphires in a single flower adds a little asymmetrical touch to each piece. The first blush of youth and beauty is ideally captured in these oral statement pieces, making them an ideal match for a white bridal gown. The colourful array that an orchid flower comes in makes it a versatile flower to be used at most weddings. Pairing graduating coloured gemstones with pearls from its own farms adds a realistic touch for Autore’s orchid jewels, making them an excellent choice for the bride who wishes to make an elegant entrance on her wedding day. An emblem of love, strength, fertility and loyalty, the orchid is a treat to the eyes. 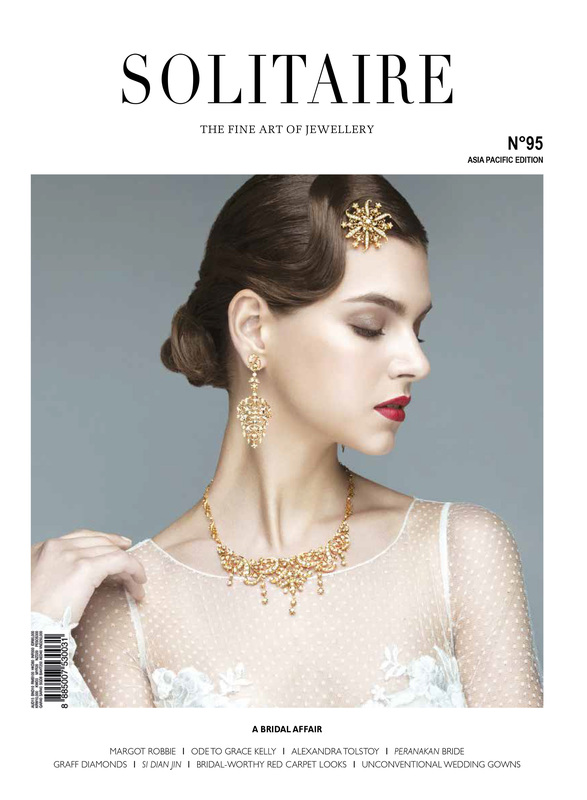 Autore’s interpretation adds an exclusive design element to the brand’s South Sea pearl line of jewellery. “Australian-native orchids and South Sea pearls are both a reflection of unique and delicate beauty — a perfect t for the bride-to- be,” shares Ruby Autore, Marketing Manager for the brand. An easy-to-miss wild flower, the Forget Me Not is a simple five-petal flower that blooms blue with a yellow centre. After their famous sunflowers and lilies, Harry Winston takes this delicate and minimalistic inspiration for their latest collection, Forget Me Not, bringing a sparkle to this otherwise modest flower. The collection is available in all-diamond, with recent addition of blue and pink sapphires. 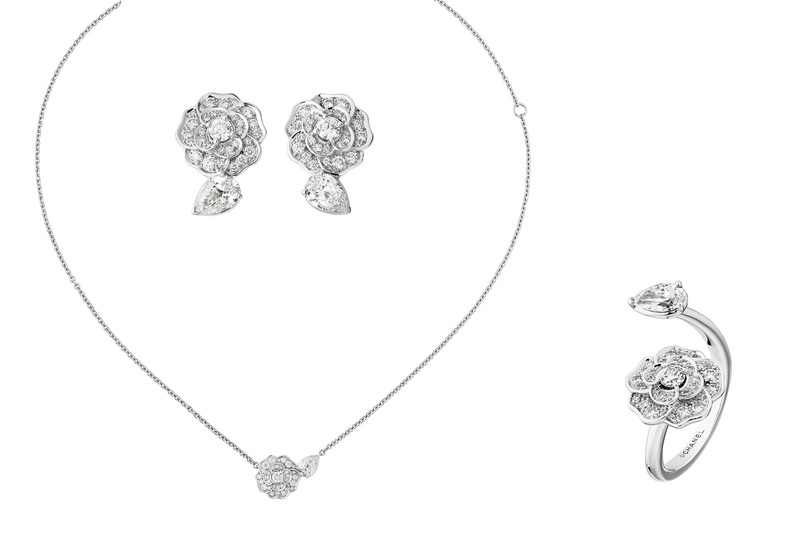 Celebrating the graceful silhouette of this flower, these daytime jewels are a suitable choice to add just the right amount of sparkle to any bride’s ensemble. Introduced to Mademoiselle Chanel by the love of her life, Boy Capel, and chosen for its purity over the opulence of a rose, the camellia was Chanel’s favourite flower. Now, a symbolic element of the spirit of the brand, the round and orderly camellia flower has found its way into Chanel’s fine jewellery, and is a perfect bridal accessory. Chanel releases a new batch of Camellia jewels every few months. The latest of which are paved in all diamonds, featuring a single pear-shaped diamond acting as a solo leaf. The sunflower turns and follows the sun every day. Its growing beauty is similar to a deep love for ones’ lover. 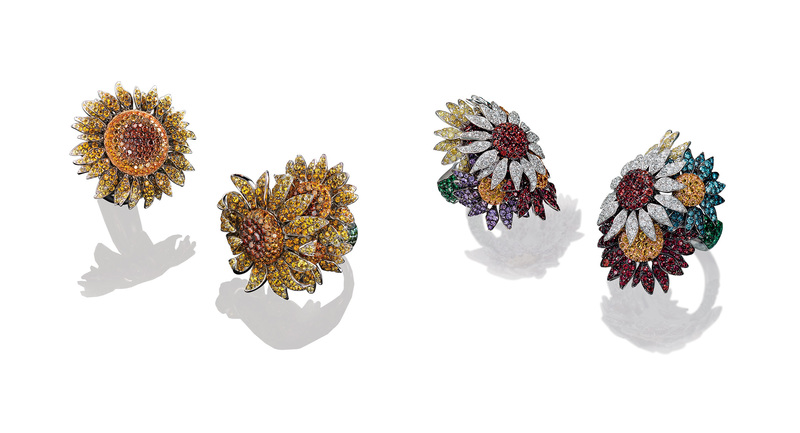 Taking this humble thought as an inspiration, Italian designer Carlo Palmiero has chosen the sunflowers for his latest collection of vibrant rings. For him, it represents loyalty and a strong bond between two people. “There are different meanings given to the sunflower. My love for nature and creativity led me to reinterpret it as a symbol of love. In a tradition as special as a marriage, flowers and bouquets are an integral part of any wedding event,” he adds.